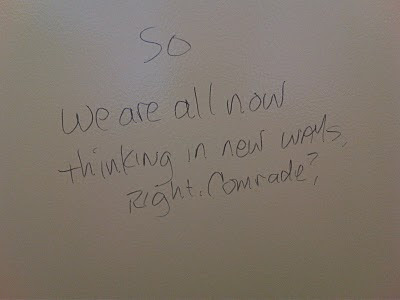 I am an enthusiast of bathroom vandalism that is either humorous or is politically astute. 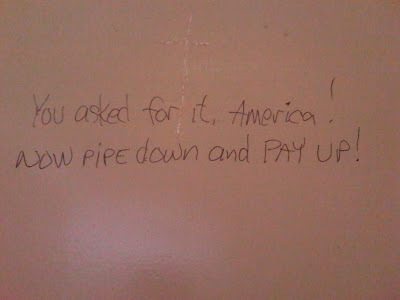 (Essentially, it has to serve some purpose) Sadly, more often than not, some public toilet "Shakespeare" misses the point completely and ventures into the territory of twelve year old's henceforth known as "crass town." 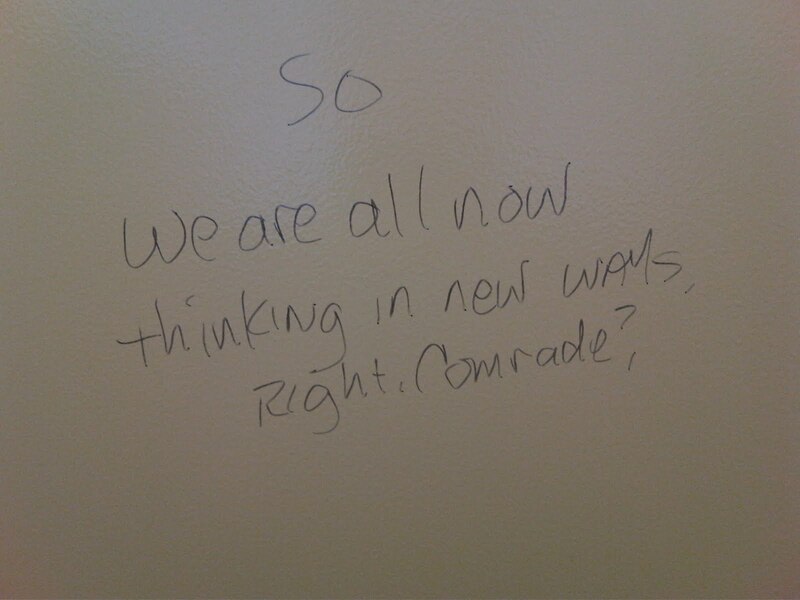 Now, you are wondering how can bathroom vandalism be politically astute, let me explain. It requires there be a level of intelligence in the discourse or provide some insight to the reader. 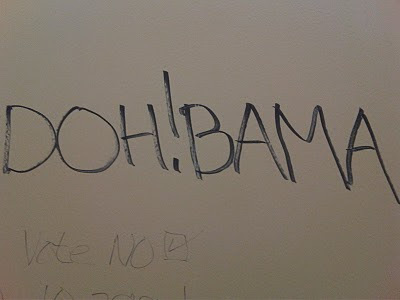 This is the proverbial tight rope that one must walk as the medium --the wall of a stall-- tends to work against the message, as will the usual use of such words as dooty, fart or booger to convey an opinion. While conducting my morning constitutional, I came across several vandals far from the Sinclair bent who fell off of the rope as their scrawls lacked the aforementioned humor and were mildly political. In short, their free time is spent watching Fox news and writing on walls than say, reading a book. So, who is up for a little critiquing the works of the uninformed political commentator? I know I obviously am! I can not find anything wrong with this, its true that President Obama is quarterbacking nearly every play out of the Bush administration's playbook but its obvious that the author had not intended to highlight failures in policy. Nice use of a Sharpie buddy, looks like the ink is running a little dry though! Americans have this distorted and misguided conception of Communism. If I see another bumper sticker or pundit assert that Obama has turned America into the land of Reds, I am going to wretch. There has been no seizure of private goods (outside of imminent domain... that is a whole different blog.) nor does the state control industry. Most importantly, when did the United States recant Capitalism as an economic practice and begin down the path to a classless society in which the state ceases to exist? I suppose the Proletarian Revolution was the second American Revolution (the secret one) and no one except people devoid of working frontal lobes knew about it. Word of advice, instead of waiting for Glenn Beck to return from its commercial break, turn off the television and pick up a book. (Hopefully, it is not one written by Glenn Beck) Your brain will thank you. 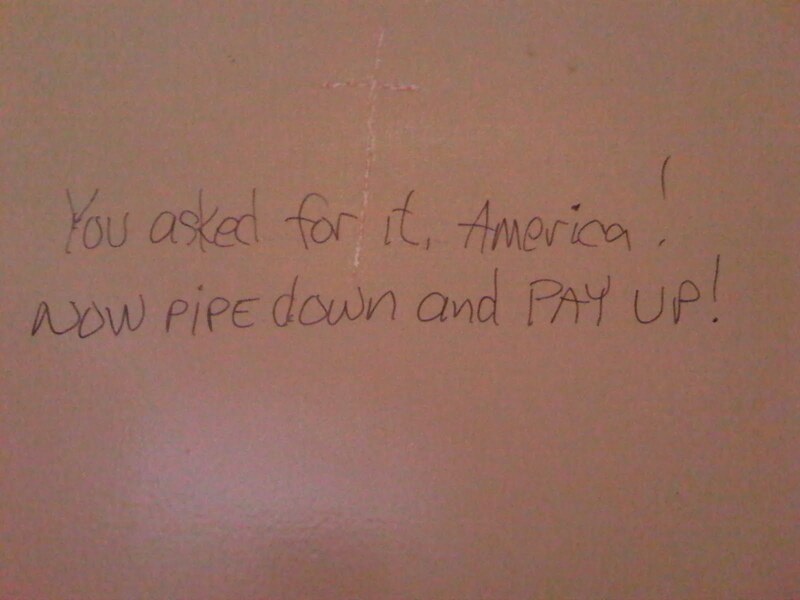 I suppose it is high time to push my idealism aside and recognize that political discourse in America is indeed dead as political debate is now taking place in the bathroom. It seems apropos considering that this is the state of American politics.